Looking for board games your little one will understand and have fun with? Games are a great way to encourage your child’s creativity and sense of adventure. Playing games with your children can also lead to deeper bonding and improved social skills. The good news is that board games really are for everyone. Read on for your list of the top five simple board games your little one will love, time and again. Looking for a board game that is both fun and education for your littlest? Look no further. The Roll and Play board game tests your child’s understanding of basic language skills, colors, animals, and numbers. The great thing about this game is that it doesn’t emphasize winning. It does teach your child about taking turns and participating. Your child will love making animal sounds and more! This game is amazing not only because it’s been around for centuries. Preschoolers and toddlers have an amazing ability to create chains and series, and this game will test their ability to do just that. This simple classic board game is perfect for little ones because it brings in playground equipment, which kids are already familiar with. It also introduces your youngest kids to the idea of start and finish, with interactive pieces along the way. Teach your child about the fun of working together with First Orchard. Participants will have to cooperate to get all of the fruit from the tree before the raven comes to eat it all up! Your littlest ones will love actually picking the colored fruits and watching the raven race to the end of the path. First Orchard is made in Germany and has been in households for over three decades. Similar to First Orchard, Hi-Ho Cherry-O encourages your kiddos to pick cherries from trees and fill their buckets in the right amount of time. The best thing about this game is that it develops basic math skills like subtraction and addition, and even involves a puzzle! Who could pass up this classic? The great news about Candy Land is not just the fact that it’s been in households entertaining little ones for generations. It’s also great for the youngest ones of the family. Toddlers will love the emphasis on sweets and adventures and will love moving their colored markers around the board. This board game is best for players age 3-4. For Ages 10+ Check Out The Wizard Always Wins! The Wizard Always Wins…but the question is, WHO is the true Wizard? Round by exciting round, players jockey for new roles –from the Trader and the Oracle to the Apprentice and more. Each of the seven roles offers different abilities that are useful for leveling up your power. Yet only the player who is the true Wizard will pull their own gem from the Bag of Fate and claim victory! Kids don’t have to wait to play board games until they can read and communicate. 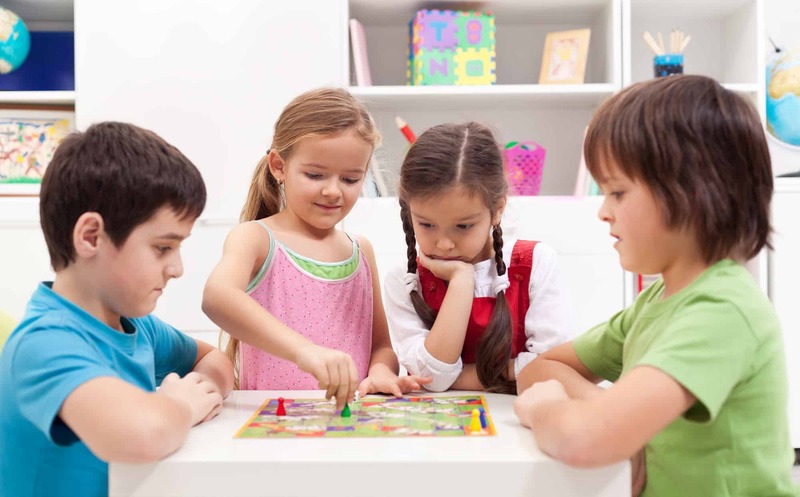 Introduce your child to the fun and learning a board game can offer by bringing home some simple board games. Entertain your toddler or preschooler with Roll and Play or test their cooperation skills with First Orchard. You can’t go wrong with the tried and true Candy Land or Chutes and Ladders, either. Spending time with your child playing these games will create memories you’ll never forget. At Big G Creative, we celebrate the art of the board game and what it can bring to you and your family. Our games are age-appropriate, fun for everyone, and designed by real people who know how to have fun. Check out what we have to offer or reach out to us today to share your board gaming experience!